I often take the kids to Kmart so they can have a look at the toys and I can have a look at the books – they often have some of the best cookbooks at the best prices. Last week, while browsing there, I found a book called Macaroons , with 30 macaron recipes, for only $9. Well, I couldn’t pass it by, so I bought it. This obviously wasn’t one of the best macaron books out there; after all, the title of the book was spelled “Macaroons”, instead of “Macarons”, but I was really interested in looking at the different flavors described in the book. Previously, I have made 3 batches of macarons from scratch (chocolate and peanut butter, matcha and white chocolate, and coffee and Nutella) as well as Donna Hay’s new macaron box mix. What? Macarons from a pre-made mix in a box? That is absurd! If you are thinking along those same lines about a macaron box mix, I don’t blame you. I tried it out for myself a few weeks ago and was extremely disappointed. The tops on all of the shells cracked; some shells had feet and some didn’t, and some had half and half. The only good thing about that box mix was that the end result tasted very good! So, the next thing I had to do was make another batch of macarons from scratch and see if I could do any better than that box mix. And my new book on “Macaroons” was just thing I needed to get me going. For my first recipe, I chose the lemon macarons. I haven’t seen this flavor of macaron very much, if at all. The shells were basically your basic recipe except lemon zest was mixed in, along with food coloring. The funny thing about this book is that they say you can use liquid food coloring, which is something I always thought was a no-no when making macarons. Nevertheless, I used yellow liquid food coloring. The filling consisted of lemon mascarpone and lemon curd. I bought whole, blanched almonds and ground them myself in my new food processor. Then I added the icing sugar and turned the processor back on to mix it together. I made sure I had the caster sugar ready to add to the egg whites when they reached soft peaks while being whisked. The lemon zest and yellow food coloring were also at the ready. My book did not recommend leaving egg whites to sit out at room temperature for a certain number of days, or even to put them in the refrigerator. It only said that if time permitted, you could let the egg whites sit on the kitchen counter, covered by a paper towel, for a few hours. So, I cracked open my eggs, separated them, and let the egg whites sit on the counter for about 2 hours. I also gave them two short blasts in the microwave (2 blasts of 4 seconds, with a shake of the glass container in between them), as I have heard that this works in much the same way as leaving the egg whites sit out – it helps remove moisture. To prepare the baking sheets, I tore off a sheet of baking paper and drew circles on the back of it by tracing the removable plastic bit in the lid of our blender; it’s the perfect size! When I turned the paper over, there would be perfect circles to trace the batter around. Everything went well in preparing the batter. As I’ve said before, the process of making macarons is extremely easy; it’s just the technique that intimidates! The almond/sugar mixture was added in three batches and mixed in using the cut and fold technique (you basically “cut” a spatula from the back of the bowl to the front, scraping the bottom, and then rotate the bowl as you hold the spatula in one place). The mixture starts out thick, but starts to loosen as you fold through. The book recommended to keep folding until the mixture fell in thick ribbons that held their shape for 30 seconds before disappearing back in to the batter. Mine were about there; although it might have been closer to 20-25 seconds. My mixture didn’t really fall in ribbons, though; it sort of fell in clumps. The piping was easy; the circles drawn on the back of the paper were really helpful! After piping, the book suggested to let the macarons sit for 30 minutes before placing them in the oven. When lightly touched, after 30 minutes, the batter should not stick to your finger. I waited for 30 minutes; it still stuck to my finger. I waited probably around 50 minutes in total before I could touch the macarons without batter sticking to me. Now, here came my downfall. The oven bit. Previously, in my homemade batches, I’ve had cracked shells each time. Not only that, there was also the constant problem I had of the feet caving in. Sure, they looked perfect in the oven, but then they would deflate. I was really crossing my fingers for these macarons to turn out well! First of all, as the recipe recommended a temperature of 160C for regular ovens, I turned the oven down to about 145C for my fan-forced oven. I baked them for 10 minutes. The book suggested touching the macarons after the recommended baking time to make sure their shell was crisp and then lightly, gently try to see if the feet are still wet by picking them up. Well, I wasn’t going to try to pick up the shells, but I gently gave a tiny twist to see if the feet moved. They did. The book then suggested that, if the feet were still wet, to put them back in the oven with the door ajar. I did this (by using a wooden spoon to stick in the oven door) for 2 minutes. I checked again and the feet did not move, so I took them out. I noticed that the shells were browning around the edges, so I turned the oven down to 140C and also left the door ajar for the rest of the batches (I had 3 batches in total because I only have 1 cookie sheet!). Everything went smoothly much to my pleasure, and the feet did not deflate! The first macarons I’ve made without the feet deflating! Awesome! The next good thing about my macaron shells – they easily came off the baking paper! The only thing I was a little let down about was that the tops of the shells were not high and rounded, but rather flattish. The filling is quick and easy. The mascarpone just needed a bit of lemon zest and lemon juice and a good stir. I bought a jar of lemon curd from the store. 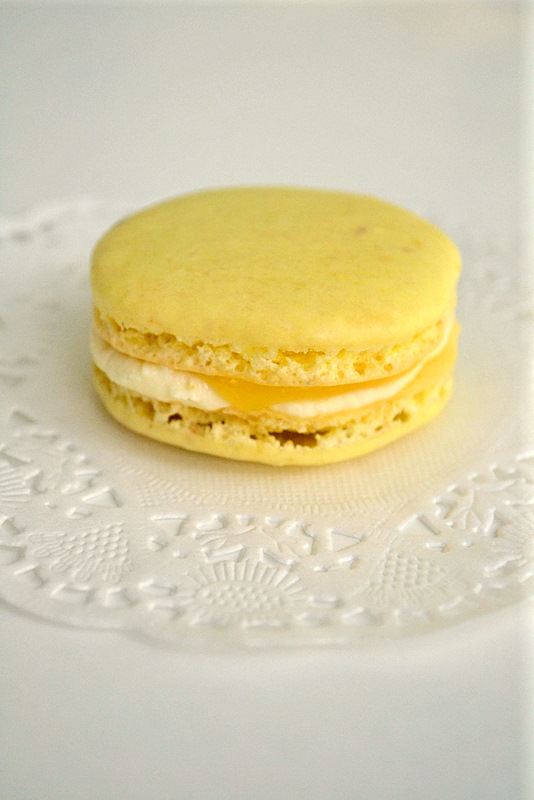 I spread the lemon mascarpone on the bottom macaron, and lemon curd on the top macaron, then sandwiched them together. The book recommended waiting 3-4 hours before eating the macarons, but seriously, who is going to wait that long? Certainly not I, so I immediately gobbled one down. Wow. The shell was so crisp and chewy! There was little to no air pocket inside the shell. I was so impressed with these. The taste was amazing, just the right amount of lemon and sweetness. Quick update: A couple of hours after sandwiching the macarons together, I have noticed that the bottom shells go really, really soggy. I presume this is from the moisture in the mascarpone and/or curd. Keep this in mind if you make these yourself, and be sure to eat them and share them with family and friends before they go soggy! “Macaroons” will certainly be getting a good workout, I can tell you that! My next recipe is going to be the pistachio flavor; hopefully I’ll get a chance to try that out later this week. 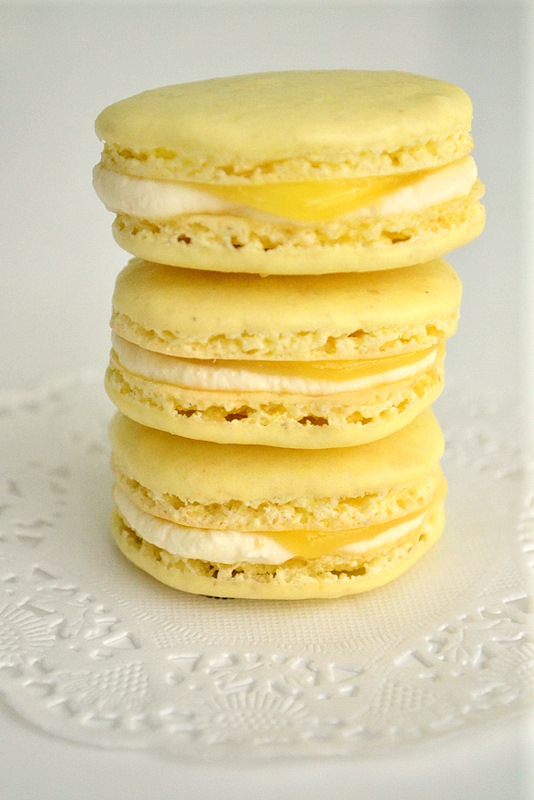 Lemon macarons with lemon curd and mascarpone filling. Place the ground almonds and icing sugar in a food processor and process for 15 seconds. Sift the mixture into a bowl. Line two baking sheets with baking paper. Place the egg whites in the bowl of an electric mixer and whisk until holding soft peaks. Gradually whisk in the caster sugar to make a firm, glossy meringue. Whisk in the lemon rind and enough food coloring to give a bright yellow color. Using a spatula, fold the almond mixture into the meringue mixture one third at a time. When all the dry ingredients are thoroughly incorporated, continue to cut and fold the mixture until it forms a shiny batter with a thick, ribbon-like consistency. Pour the mixture into a piping bag fitted with a 1-cm round tip. Pipe 32 small rounds onto the prepared baking sheets. Tap the sheets gently on a work surface to remove air bubbles. Leave at room temperature for at least 30 minutes, or until the batter does not stick to your finger when touched lightly. Preheat the oven to 160C. Bake in the preheated oven for 10-15 minutes. Cool for 10 minutes, then carefully peel the macarons off the baking paper. Leave to cool completely. To make the filling, beat the mascarpone, lemon rind and lemon juice together until smooth. 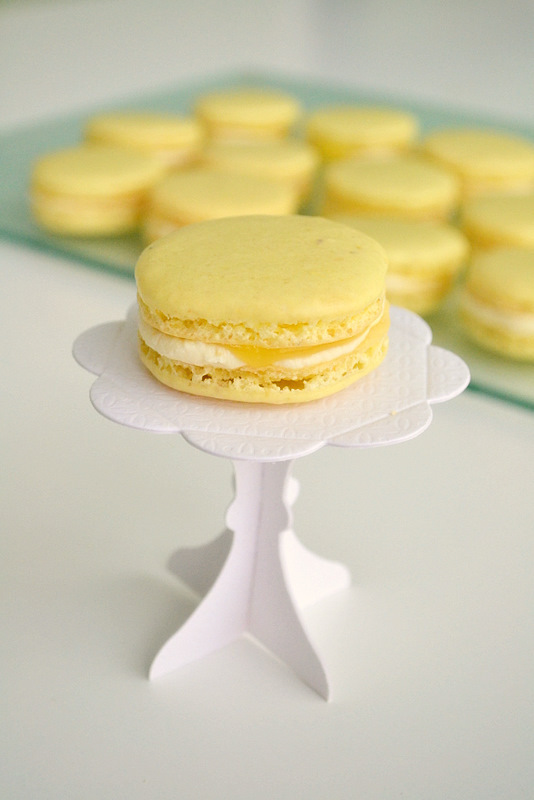 Spread the lemon curd over half the macarons and the mascarpone over the other half. Carefully sandwich the pairs together. Wow never heard of the macaron box mix. These beauties are certainly a trial to make. I struggle with mine every batch. Your lemon ones look perfect! Please do post the pistachio recipe too when you try it out! I love the photos of the macarons, i will give them a go. love your Blog. The macarons look great! I love the lemon and mascapone combo. these look great and thanks for sharing your “macaroon” experience..i love them and have been meaning to try…guess i need to take a friday nite and try! These are delicious! To save them getting soggy, I simmered lime juice and lemoncello in a pan for a few minutes to evapourate it and mixed it with the marscapone instead of using lemon curd…. it was a good mix of sweet and sour.